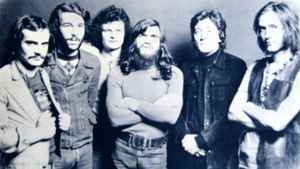 Initially to be called La Question, this French band was created in April 1969 during the studio sessions of their eponymous album. Internal discrepancies will appear quite fast in the band. The problem is simple: playing progressive rock or sticking to jazzy and blues music? Tony Canal will be the first to leave the band, followed by Michel Bonnecarrère, both in 1969. Pierre Fanen & Joël Daydé will leave in 1970. The same year, they'll meet with Léo Ferré. Together they will record "Le Chien" and La The Nana, and Zoo will also be responsible for the orchestration the next year on Ferré's album La Solitude. So huge is the success both for Zoo and Ferré that the whole band will be invited again to play on Amour Anarchie - Ferré 70. In parallel, Zoo will replace Daydé by recruiting the English Ian Bellamy, simply through the magazine Melody Maker. September 1970, Zoo records its 2nd opus. 1971 will be a year seeing great collaborations, Ferré, as already stated, but also Nicoletta (2). Their last album Hard Times, Good Times will be released in 1972. They then disbanded as they were not duly promoted by their label. Some of their members then formed the band Z.O.U.